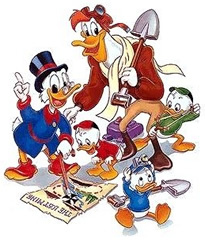 Huey, Dewey, and Louie (Russi Taylor) are left in the care of their Uncle Scrooge McDuck (Alan Young) when their Uncle Donald (Tony Anselmo) joins the Navy. Scrooge is the richest duck in the world and is always on the lookout for ways to increase his wealth. With his three nephews and brave but naive pilot Launchpad McQuack (Terence McGovern), he travels the world in search of treasure. Scrooge’s money is often the target of plots hatched by criminals like the Beagle Boys gang (Frank Welker, Chuck McCann, Brian Cummings, Peter Cullen) and evil witch Magica De Spell (June Foray). Other characters include Scrooge’s accountant Fenton Crackshell (Hamilton Camp), absent-minded inventor Gyro Gearloose (Hal Smith), wealthy rival Flintheart Glomgold (Hal Smith), prehistoric Bubba the Caveduck (Frank Welker), butler Duckworth (Chuck McCann), and nanny Mrs. Bentina Beakley (Joan Gerber) and her granddaughter Webby Vanderquack (Russi Taylor).